Come, Now Is the Time: Vineyard Music EXTRA! 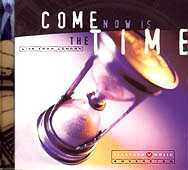 Come now is the time is the first VMG (UK) recording and features a number of the UKs songwriters for the first time. Well what can I say  Come, now certainly is the time!. This mix of passion, intimacy and excitement, with the haunting overtones of the celtic Ullian pipes in the background, blends to produce a truly refreshing expression of worship. From the very celtic A Place in the Hills to the more Commitments style The Lord is Gracious and Compassionate this album cries out with a hunger for God that few recordings capture. Every time I come back to this album I am blown away by how awesome our God is and yet filled with such excitement about the things he is going to do in the future. If its west coast soft rock you are after Im afraid you will be disappointed, but my advice is  sell your bed  buy this CD! Simon McMurtary <simon.mcmurtary@wycliffe-hall.oxford.ac.uk> is studying at Oxford, England.